In a research driving simulator the effects of time-on-task were measured on variables that measure drowsiness, driving performance and steering behaviour. It was found that the fraction of time during which the eyes are closed is a good measure of drowsiness that is sensitive to the effects of time-on-task. Of all single variables that measure driver performance and impairment, the percentage of time during which any part of the vehicle exceeded one of the lane boundaries was the most strongly affected by time-on-task. Also, with progressing drowsiness, the amplitude of steering corrections increased towards larger values. This was caused both by larger error corrections in response to larger errors and by an increase in coarseness of the steering response. Large steering corrections proved to be the single best indicator of progressing impairment by drowsiness and fatigue. LANEX, i.e. the fraction of time during which any of the wheels exceeds the right lane boundary. SDLP, i.e. 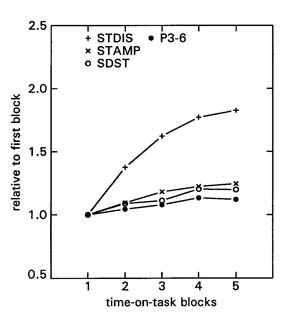 the standard deviation of lateral position, with respect to the first block. TLC1.0, i.e. the percentage of TLC minima smaller than 1.0 s.
P3-6, i.e. 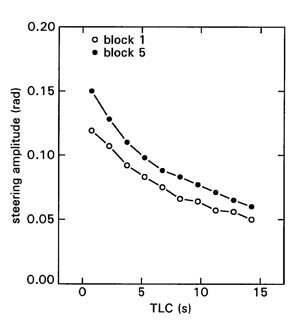 the power of fast steering movements (in the domain of 0.3-0.6 Hz) as a fraction of all steering activity < 0.6 Hz, with respect to the first block. STDIS, i.e. the fraction of larger peak-to-peak steering amplitudes. This was computed as follows: for the first block the distribution of all peak-to-peak steering amplitudes was computed and the 80th percentile value (i.e. that value for which 80% of all values are smaller and 20% of all values are larger) was determined. Then, for all subsequent time blocks the percentage of values that was larger than the initial 80th percentile value was computed and divided by 20 (i.e. the percentage larger than the value in the first block). Figure 1 gives a graphical illustration of this principle. 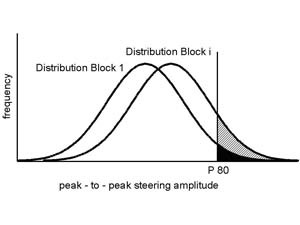 There are two bell-shaped distributions of peak-to-peak steering amplitudes. The left distribution refers to the first block, while the right distribution represents block i. The idea then is that as drowsiness progresses, the distribution of steering amplitudes shifts towards larger values (to the right). The vertical line represents the value of steering amplitudes, during the first block, that separates the 20% largest values from the 80% lowest values. The sum of the striped and black area represents the percentage of values that is larger than P80 of the first block. STDIS then is the sum of the black and striped area divided by the black area. Godthelp, J. (1988). The limits of path error-neglecting in straight lane driving.Human Factors, 28, 211-221.